Victoria Drive, a hidden gem near Penticton's downtown. This 3-bedroom bungalow with finished basement sits on a large flat lot. It shows beautifully with refinished hardwood floors, a new kitchen, new windows, and a skylight in the bathroom. The back deck faces west towards the sunsets. Alley access, plenty of room for a garage or workshop. Other recent improvements include a new roof in 2009, heat pump and an irrigation system in the xeriscaped backyard. 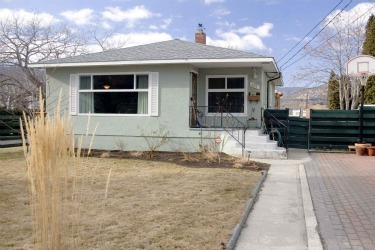 Seller may consider a trade for a townhouse or half duplex in Penticton.